As if anyone needed another reason not to go to North Carolina. 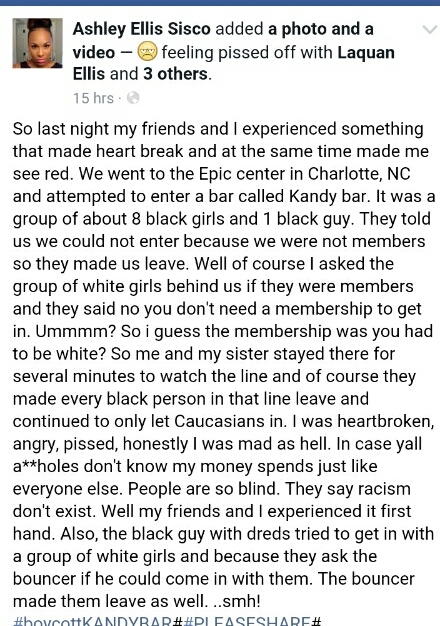 A woman who was there visiting the Epic Center claims she and her friends were not allowed to enter popular hotspot Kandy Bar because they were black. In a Facebook post that has since gone viral with over 5000 shares, she informs us that she and her friends were not allowed to enter and that the bouncer told her there was a membership when she inquired to some white patrons were allowed to enter they were told there was no membership. She has currently started the petition named #boycottkandybar that is already picking up steam. The bar was not available for comment.